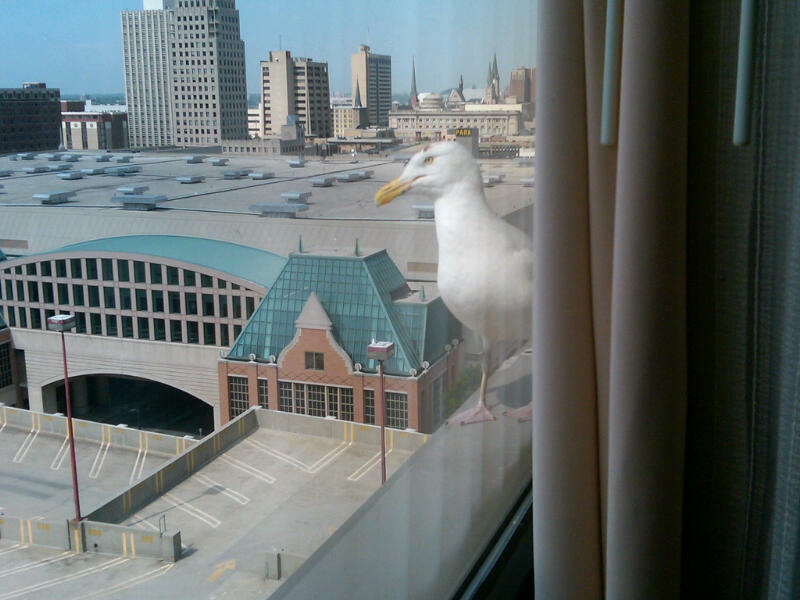 Someone just stopped by my hotel room to say hello. 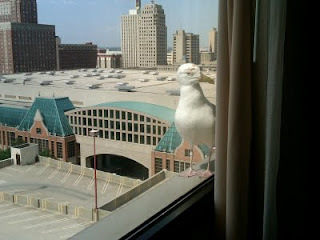 I think he/she wanted to borrow a cup of sugar but I didn't have any! Last Saturday was a PERFECT night for a gathering at the cabin on the family farm. It was in the 80s with a nice breeze...couldn't ask for better. So Dad decided to fry up some fish. I don't have any photos of the finished product...it was consumed as quickly as Dad could get it fried! But I did snap some random shots of the family. We call this uncle the "baby whisperer." maybe it's because she has three boys at home! Not quite old enough for fish, JJ had to settle for puffs. "So how's it going up there?" A good night for a walk. Hopefully we have a few more nights like this one this summer. 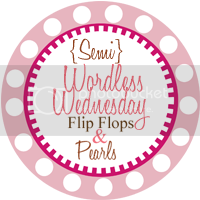 Linking up to Pinke Post's Wordless Wednesday. As I shared with you on Sunday, I tackled my In the Kitchen Gooseberry Patch Recipes 7, 8 and 9 in one meal over the weekend. You can check out numbers 7 and 8 here. We finished our "Sunday Brunch for Supper" meal with these super easy Hot Cinnamon Twisters - Recipe 9. The only thing that may have made these better was some icing! Well, I just have one more dish to make before I give away a copy of this great Gooseberry Patch cookbook! Stay tuned. Also linking to Two Maids a Baking! My nephews always want to help me (except when it comes to picking up their toys) do "chores" when they come over to my condo. So when Ty-Ty came over last week, he HAD to help me water my flowers. The problem was that I only had a large watering can that was way too big for him. That's where my pail from Red Hill General Store come in handy. It was the perfect size (2 quarts) for this almost 3-year-old; however he thought it was a bit heavy so I only filled it about one-third of the way. "Look, Mimi, I'm carrying a bucket!" "Hey, it's all gone. MiMi more water!" Then he moved on to the other planters before moving on to the landscaping around the fence. It was too cute because each time the bucket was empty, he gently set the bucket on the grounds and then turn to me and say "More water, MiMi!" It took a bit longer than normal but it was worth watching the concentration on his face as he carefully watered each and every plant! Interested in getting your very own bucket from Red Hill General Store? 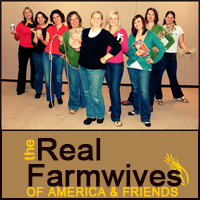 Head on over to the Real Farmwives of America and Friends and look for the giveaway. One lucky reader will win a Galvanized Embossed Tub from Red Hill General Store. Also, check out the Real Farmwives of America and Friends Facebook page and see how the other gals used their buckets in the home or garden! Disclaimer: While Red Hill General Store did provide me with a bucket to blog about for this post, the photos, ideas and opinions above are my own, of course. I LOVE breakfast for supper. I love the idea of breakfast at any time of the day, except in the morning. I don't normally eat breakfast (yes, I know that is not good for me) but I do love breakfast foods. So, I decided to fix not one, not two, but THREE brunch recipes from Gooseberry Patch's Christmas Kitchen as part of my In the Kitchen project! I made Baby Sister help me make these and then shared them with her family tonight. I'm sharing two of the dishes we fixed tonight and will share the third later this week. Here's recipe number 7 in my journey to cook 10 recipes from this book...Tina's Creamy Bacon Crescents. As you might recall, my goal is to stick with recipes with less than 5 ingredients...this one had three! These were super easy to make...however, we questioned when they were done because the bacon wasn't quite crispy when the timer went off at 20 minutes. But, they were yummy. I didn't use a whole container of cream cheese so the flavor didn't come through as much as it might have if I layered it on thicker...next time I'll add more! For the "main course," I decided on Scrambled Eggs in Toast Cups. You'll notice the recipe below has 9 ingredients and we added bacon (had some leftover from the crescent rolls) so that's double my ingredient limit! These were a bit of a challenge, though Baby Sister did most of the work on these. I bought "very thin" white bread but it was still a bit hard to cram them into the muffin tins. As I said before, we added bacon and left out the mushrooms. I'm sure you could add diced (I wouldn't do chopped) veggies to this if you'd like. These were both very yummy and the toast cups would be a fancier version of a breakfast casserole on Christmas morning. 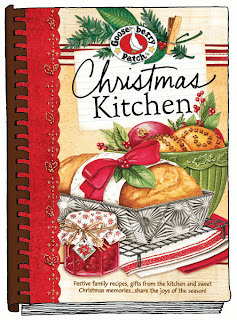 Just two more recipes to share before one lucky reader wins her/his very own copy of this Gooseberry Patch cookbook. Special thanks to Gooseberry Patch for providing me with this great cookbook to try and share with you. If you would like to purchase this or other cookbooks, please visit their store. If you would like to see other great recipes, check outwww.realfarmwivesofamerica.com. I haven't done a What I'm Loving Wednesday in a while so I thought "why not?" I'm loving these chips. They've changed my life. It sounds dramatic, but it's true. I was never a big fan of the kettle cooked potato chips but these changed my mind. I may or may not have eaten these at 7 a.m. on a Saturday morning. I'm loving that my baby sister hosted a Houseparty last weekend featuring Breakstone's Zesty Blends sour cream and sour cream dips. She had some yummy appetizers featuring the Zesty Blends Chipotle and Garlic and Herb sour creams. Baby Sister made our Aunt Peggy's famous taco dip with the Chipotle Sour Cream and it gave the dip a nice kick. Even more than the food, I enjoyed an evening with my family in the home that I used to visit my grandparents in...now home to my baby sister and her family. I'm loving a conversation I had with some friends the other night. One of them recently lost her brother to a long battle with cancer. For his obituary and memorial photo, they used one of him in his mid-twenties because that is what he'll look like in heaven (when you get to heaven you revert to the age/look of your best self). I guess this thought is from a book that I must find and read soon. I LOVE the idea, just absolutely love it. I'm loving all the great things on Pinterest...especially my board dedicated to Butterflies! I'm loving that I'm getting to walk more often these days. I don't think my pace would be considered "exercise" by most, but I sweat while I walk so it's exercise to me! Want to have some fun with your kids this summer? It's the Year of Soybeans at the Indiana State Fair and to celebrate Indiana soybean farmers are hosting a fun photo contest this summer. Check out Bennie the Bean on Facebook and download your own "Flat Bennie." Then take him with you to your favorite summer destination, snap a photo with him and upload it on the contest site! The first contest runs until June 27 and then the fun starts! You get your family and friends to vote on your photo to win. The prize is an iPad and tickets to the fair! There is even a second contest that starts in July! I took Bennie with me and the nephews when we went to the Indianapolis Zoo recently. Can you tell by the last photo that someone was a bit grumpy? To learn more about soybeans, visit the Indiana State Fair's Year of Soybeans page or Indiana Soybean Alliance's website. Linking up to Pinke Post. For full disclosure, I work for Indiana soybean farmers and the Year of Soybeans is a project that I'm working to plan so I'm really excited about it and want to share it with everyone I know. That's why I did this post. If you have questions about soybeans and how they are grown in Indiana, let me know and I'll be glad to answer them (or get you an answer from someone who know more than I do).